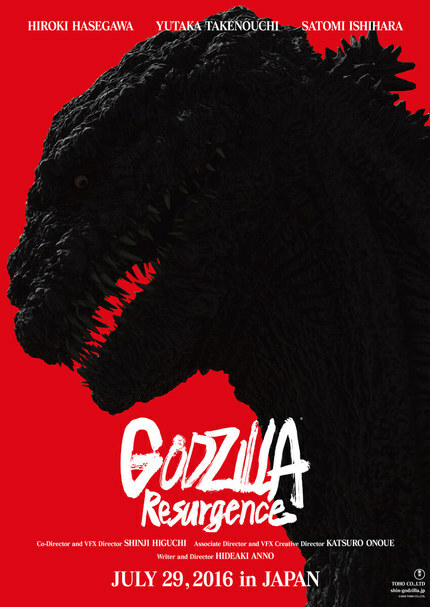 Neon Genesis Evangelion creator Anno Hideaki's new live action Godzilla Resurgence hits Japanese screens on July 29th and with the release just around the corner a new theatrical trailer plus a new TV spot have just arrived online. The trailer follows the same formula as the earlier release, opting for an epic score over long shots of broad scale destruction. The approach seems to be all about mood and tone and showing off the actual beast itself and, good lord, when it works it really, really works. Watch for the shots tracking the helicopter squadron, in particular. This thing is being released on IMAX screens in Japan and Anno has clearly taken advantage of the broader palette afforded by the huge screen format and I sincerely hope there is a chance to see it that way on this side of the ocean at some point. The TV spot is a much more conventional affair featuring more action shots of the human characters while poor Godzilla gets shot in the groin by quite a lot of tanks. That can't be comfortable, not even for a giant radioactive monster. Oh man. Sign me up! Those long shots! This Godzilla with his T-Rex atrophied arms and his weird shuffling as the crow flies gait, resembles an old age pensioner making a beeline for the toilet using a zimmer frame. His red lighting can also turns purple if he turns green he will resemble the keyboard and mouse I'm using now. The only thing that can save this film for me now is if Godzilla continues to cycle through the colours of the LGBT flag and is cutting a path to the ancient heretofore unknown Zilla spawning grounds where He Godzilla is going to give birth to Godzuki. I sure hope this doesn't end up being two hrs of Godzilla shuffling through Tokyo (notice that they conspicuously avoid showing Godzilla's legs) while the JSDF lobs bombs at him, only for Godzilla to just turn around and shuffle back into the Pacific. Is this a recycled Godzilla Plot? One of the last of the Japanese styled Godzilla that I was able to watched dubbed had this look pretty much the same red flashy so that he'd die, and be replaced by a younger one. I hope that's not the case, but if it is then I've already seen the film so why would I want to see it again? looks positively sublime after the travesty of the american reboot. a sense of humour in evidence, something else missing for the gareth edwards film.